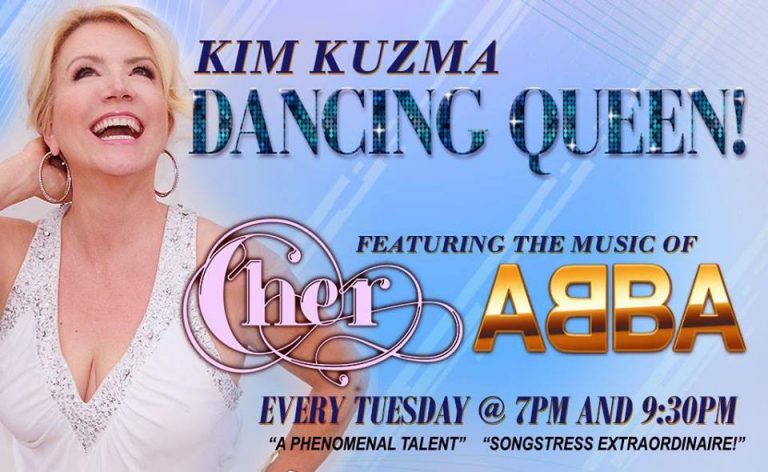 Puerto Vallarta’s best known and adored songstress, Kim Kuzma, opens her season at The Palm Cabaret on Tuesday, November 27th with her electrifying new show, ‘Dancing Queen,’ featuring the music of Cher and ABBA. Kim has performed for many an audience throughout Canada, the United States, Europe and Mexico, with 14 seasons in Puerto Vallarta. Kim is sure to ‘wow’ her audiences once again with her breathtaking vocals, original style, edgy humor and nonstop, energetic performances. As a well known Vallarta entertainer, Kim consistently delivers a remarkable performance year after year. She always introduces fresh material and an exciting, first-class show that people flock to again and again! This season, Kim and the band are doing the favorites of ABBA and Cher with some Latin flavor. You’ll experience songs with rhythmic twists and even some mashups of both Cher and ABBA in the same song. And you can always count on Kim to add her special, signature flair to the music. Some have playfully named it the ‘Kuzma effect’! Kim reinvented herself in 2012, when she hired a group of outstanding musicians and together each new season, they continued to earn great success and popularity in Puerto Vallarta. This season, Kim has added some new talent, by bringing on the superbly talented Nate Buccieri on the piano and vocals and newcomer Alexis Mena Torres on percussion, adding jazz and Cuban beats to the band. Beloved musician, Eduardo Leon, once again returns on guitar and vocals to complete the band perfectly! With Cher making music history, recording an ABBA album, Kim was inspired to combine the iconic music of legends Cher and ABBA, for a spectacular performance. You can expect wonderful surprises as Kim and her band of exceptional musicians thrill audiences with each and every performance. Get ready for a vibrant, fun and exhilarating show! You’ll even be able to sing along as Kim and the band deliver this inspiring music in their own unique way! Your trip to Puerto Vallarta will be complete when you enjoy the music of these known artists woven together perfectly by Vallarta favorite, Kim Kuzma!